Protest • They say there is "corruption in the system." 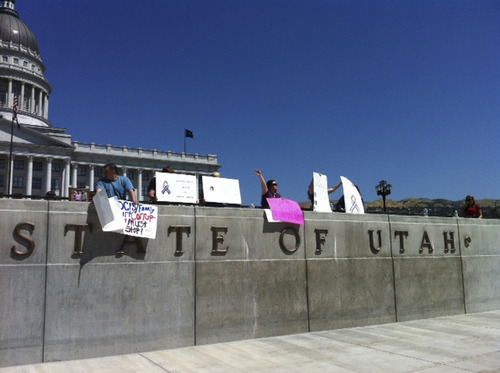 Brooke Adams | The Salt Lake Tribune About two dozen people gathered at the Capitol Friday to protest what they claim is unfair treatment of parents by the Utah Division of Child and Family Services. Some dozen Utahns who said they haven't gotten a fair shake from the state's child welfare agency gathered at the Capitol on Friday to call for a "forensic" audit of the Division of Child and Family Services and other entities involved in juvenile cases, including the courts, the Guardian Ad Litem's Office and Child Protective Services. Led by Darcy Van Orden, an activist who is one of the leaders of Utah's tea party movement, the protesters claimed the entities are unjustly taking children and placing them with foster and adoptive parents because it's more lucrative than working to reunite families. The event was part of a national protest of government abuses, Van Orden said. "I believe there is corruption in the system with built-in incentives for caseworkers to remove children from homes," Van Orden said, adding that too much federal funding goes to support foster care and adoption rather than family reunification services. Several mothers shared stories about their involvement with DCFS and the judicial system, alleging they were denied due process and required to wage expensive battles to combat false allegations and flimsy reasons  such as claims of dirty homes  for removing children from their care. Lynne Skowronski, who lives in Davis County, said she spent seven years in a custody dispute with her ex-husband over their six children, a fight that wiped her out financially. That experience, and stories of other moms, led her to question how DCFS operates and where its money goes. Skowronski said "good parents" are drained by having to pay for supervised visits with their children, custody evaluations and other costs ordered by Utah judges. A legislative audit released in February found DCFS spends more than $112 million on foster care and adoption assistance, but just $7 million on in-home services aimed at helping reunify families. The audit recommended that the division "reverse its practice of diverting resources from in-home programs." DCFS spokeswoman Liz Sollis wrote in a statement that the agency is in the process of meeting the recommendations of the audit and has already met one of them by centralizing intake through a new statewide toll-free number, 1-855-323-DCFS (3237). The agency has other review processes, such as quality improvement committees, Sollis wrote. "If someone has concerns or complaints about our processes, they are encouraged to call the Constituent Services Representative, 801-538-4100, or the Office of Child Protective Ombudsman, 801-538-4589, http://www.ocpo.utah.gov/," wrote Sollis. "Child safety is our number one priority and we work to keep children and families together whenever possible  removal is always the last option."